SAIC says it will build the Roewe 350, pictured, in Longbridge, England. SHANGHAI -- Shanghai Automotive Industry Corp. plans to build and sell a right-hand drive version of its newly unveiled Roewe 350 hatchback in England, said Chen Zhixing, executive vice president of SAIC. Chen, who is also head of SAIC's own brand vehicles, made the remarks at the ceremony held last week in the east China city of Nanjing marking the new car's roll-off from the production line. The new car, which rolled off the production line at SAIC's Pukou plant in Nanjing, has a wheelbase of 2,650mm. It is 4,520mm long, 1,780mm wide and 1,500 high. It carries a 1.5-liter gasoline engine and a five-speed automated mechanical transmission. Pricing information of the Roewe 350 remains unknown. Chen didn't provide a timeframe for the car's production in England. At present, SAIC has a plant as well as an r&d team in Longbridge in England. In January, SAIC said it plans to sell UK-made MG cars in Europe at the end of the year. Assembly of MG-series models, including the MG 6, would begin at its Longbridge plant in England late this year, SAIC Chairman Hu Maoyuan told Reuters on the sidelines of Shanghai's annual People's Political Consultative Conference. SAIC became the owner of MG Rover's 10,000-unit Longbridge plant in Birmingham, central England in 2007, after a merger with its much smaller peer, Nanjing Automobile Group. Nanjing had aquired MG Rover in 2005 after Britain's last remaining domestic volume carmaker collapsed through financial difficulties. 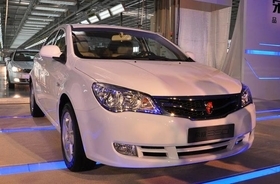 SAIC launched its first self-developed car, the Roewe 750, based on technologies acquired from MG Rover, in March of that year, followed by the Roewe 550 and MG 6 models, popular with young, elite professionals in China.